What once was a simple blogging engine has blossomed into the “go to” Content Management System (CMS) and underpinning for many of today’s websites. Its flexibility, ease of use, and expandability make it easy for many to create an engaging and modern website. Of course, just as owning a word processor and its limited array of templates doesn’t make a typist into a world-class typographer and designer, just using WordPress and a few free themes doesn’t make for a well crafted website. This is why web designers and developers are still in business. Convinced that Themify is awesome? Click here now! For anyone familiar with the huge array of themes available, both for free and purchase (read: “Premium”), there are almost too many from which to choose. It may be tempting to buy the first theme that looks pretty, but the beauty of a well-crafted theme is how it functions on the back-end. There are individuals and firms publishing some fine looking themes, but not all work the same. Some of them rely heavily on shortcodes to do the design work. This winds up meaning that when developing sites, you don’t get a WYSIWYG experience, and often design decisions wind up being a bit of guesswork and finesse. 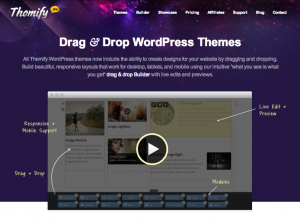 I’m happy to say that after using the WordPress themes from Themify for over a year, their themes really do have it all. The Dashboard of WordPress is pretty powerful (although I’m still not used to it as of version 3.8! It just looks different!). Even with an initial clean installation, WordPress can already do a lot. But with a powerful and custom theme dashboard, you can do so much more. Themify has a dashboard control that is a pleasure to work with. You can control just about any aspect of your website or blog through it. Change your header or footer code, alter search settings, adjust default layouts, enter your social links… the feature list is rather huge. Likewise, the ability to stylize everything from your pages’ background, body font, form elements, sidebar… I can’t even begin to list everything you can easily change right from the Themify panel. You can even update their themes from within your website. Often, if you’ve ever purchased a premium theme before, you have to delete the old theme and manually upload the newer version. Themify lets you log in from your website to your Themify account in order to update. Ahhh. So much better! Each theme has some different feature sets. Some have a robust section feature, which is then further tailored to accommodate highlights, testimonials, portfolios, or services. Just look at all those themes! And, of course, what good would this back-end be without some awesome design work. 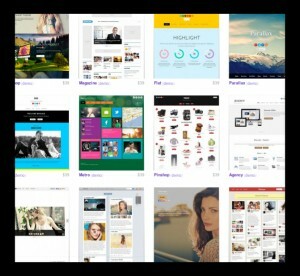 Themify.me has (as of today) 40 themes from which to chose. They load quickly, look great, and many are responsive for today’s mobile websurfer. You can purchase each theme separately, or for $70, get every theme plus updates for a year! $90 if you need the PSD files. 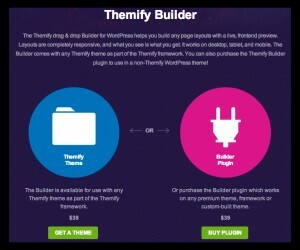 I haven’t said anything yet about one cool feature they released recently: The Themify Builder. The Builder can be purchased separately as a plug-in, but really shines when used with Themify themes. The Builder lets you lay out your pages and posts with a lot more finesse and ease than shortcodes alone. Need to make columns? Want finer control of image placement? The Builder really helps designers create dynamic and engaging pages quickly and easily. None of these things really matter if you can’t create the website you ultimately want. Designers can start with these themes, and creativity and knowing how WordPress works gets you 3/4 of the way there. The final piece is support. The support forums at Themify are really first-rate. My personal experience with the response time has been around 24 hours, but often I’ll leave a comment at 6 p.m., and by morning, I’ll get an answer to a challenge I’ve had. Even other users chime in with quick and useful responses! With a great variety of themes, an extremely solid and powerful back-end, and an intuitive page Builder, Themify has what you need to build the website of your dreams. And if you can’t do it by yourself, Make Tech Better is there to help you the rest of the way! NextElegant Themes finally allows updates from the WordPress Dashboard!